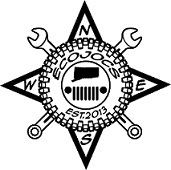 East Coast Offroad Jeepers Of Connecticut (ECOJOCS) is an organization of like minded Jeep owners looking to promote safe and environmentally responsible offroad excursions. Established in August of 2013 we are a family oriented social group that enjoys getting together for trail-rides, wrenching days, BBQs, camping trips and all types of social events that involve 4×4 Jeeps. ECOJOCS is based out of the Windsor, CT area but we have members from all over Massachusetts and Connecticut. We welcome Jeeps – from stock to modified.